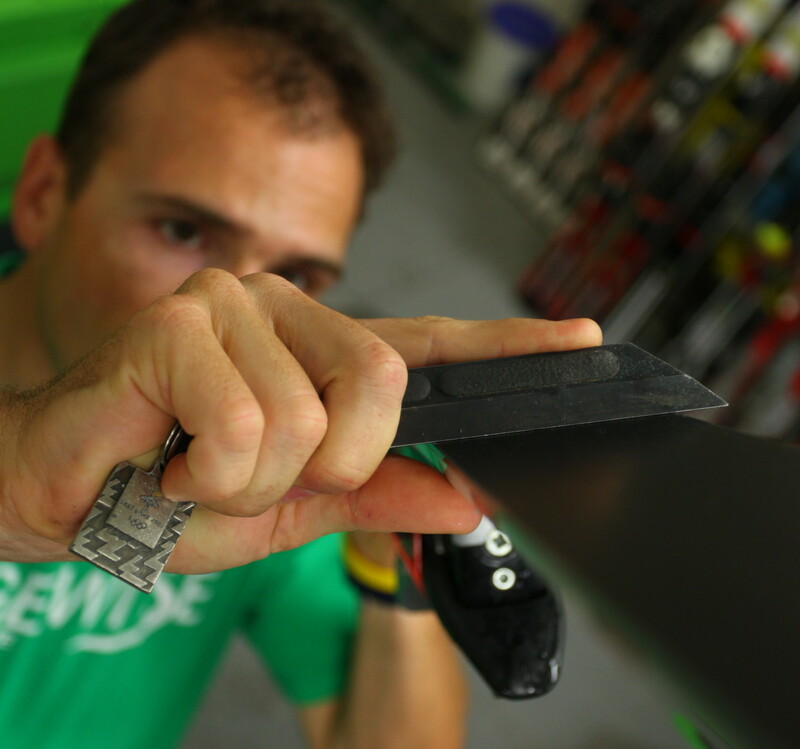 These are the steps that a pair of skis being cared for by a World Cup technician will undergo. Our service menu explains which of the steps are a part of each prep we offer. For your skis to undergo the entire process, choose an Olympian Prep plus Ski Measurements. WHAT: A careful look at the current condition of the skis and an assessment of the true angles of bases and edges. HOW: Though damage to a ski may be clearly evident, in most cases, the small adjustments that will make a ski perform better can be identified only with a trained eye and careful measurement with a true bar. WHY: Every pair of skis is different. Also, your skis may not be set at the angles you think they are. WHAT: Excess material is removed from the sidewall and topsheet to “shape” the ski to a tapered, rather than vertical, edge. HOW: Material is removed using a combination of hand tools. Remaining material is sanded smooth. WHY: Creating a tapered sidewall and topsheet will prevent the ski from pushing into the snow while the ski is on edge, which causes loss of power and performance (the same effect as “booting out”). Additionally, removing sidewall material makes it easier to properly maintain skis because a bevel guide can properly rest on the edge of the ski and create the desired bevel. WHAT: The side edge bevel is set to the specifications of the individual skier. HOW: Side edge bevels are set by hand in the tips and tails and then set by machine and checked individually for precision (Olympian, World Champion, Europa Cup and NorAm preps). Disk sharpening is now the standard in every discipline of World Cup ski racing, but we can sharpen by hand if requested. WHY: Side edge bevel determines the power and durability of the edge. For example, a 3 degree bevel will hold better on ice than a 2 degree, but will not stay sharp as long. We disk sharpen because new technologies allow for a very precise, incredibly smooth, sharp and burr-free finish. Sharpness created this way lasts longer and returns quickly with a stone touchup. WHAT: Bringing the base of the ski back to true flat before restructuring. On a truly flat ski, the base material and the base edge form a seamless transition on the base of the ski. HOW: A three step, progressive stone grinding process allows us to flatten the base material until flat and free of any structure. WHY:  Before new structure is applied to the base of the ski, the old structure needs to be blanked out. Also, a ski needs to be truly flat in order to correctly set base bevel. WHAT: A base grind that is specific to the conditions and/or disciplines in which you ski. At Edgewise, there are 8 grinds that are currently being used by athletes on the U.S. Ski Team. These same grinds are available to our customers and can be reproduced consistently every time. Edgewise can also customize a grind to meet your specific needs. HOW: Our stonegrinders are capable of an infinite number of grinds. We design, test and refine our most commonly used. WHY: The pattern of the grind determines how the ski moves water. Different grinds are faster in different conditions. WHAT: Setting the base bevel at the angle best for your skiing. Base bevel generally ranges from .25 degrees to 1 degree. Edgewise recommends starting with less base bevel rather than more. Adding base bevel is a simple process, while removing it requires regrinding and shortening the life of your skis. A half degree of bevel is a great place to start, and is the standard for most levels of alpine racing. HOW: Base bevel is applied by machine, using the precise base bevel programs and latest technology. Base bevel is then checked by hand with a truebar. WHY: Base bevel affects how reactive a ski will be on snow. Too much base bevel will make the skis feel damp and lifeless, and may contribute to a lack of hold in firm conditions. WHAT: Making the edges smooth, fast, and sharp. HOW: Touch-up is done with a progression of diamond and ceramic stones. WHY: Smooth, clean edges glide well and give superior edge hold on firm snow and ice. WHAT: Determining the true turn radius of a pair of skis. WHY: The FIS only requires a minimum turn radius to be listed on the skis. Often, the true radius of a pair of skis may be longer or straighter than the listed minimum. By understanding the exact turn radius of a pair of skis you can determine what shape works best for your skiing style. WHAT: When skis come out of a mold, sometimes they will shift side to side. HOW: When a skis are made, if they don’t stay in the mold for the proper amount of time they can shift in the waist. As the epoxy/resins in the ski cure, they can push and pull on the interior construction of the ski, changing the shape and sidecut of the ski. WHY: If the waist of a ski changes, one side of the ski will turn easier than the other. If one side of a 27 meter ski shifts too far, it can change the turn radius to 26 meter on that side, making the other side of the ski 28 meter. The more you know about your equipment, the more you can use it to your advantage. WHAT: Getting the wax deep into the base material and cleaning the structure. HOW: We start by using glide wax cleaner to remove any impurities or grinding emulsion from the skis. Wax is ironed into bases at appropriate temperature so as not to burn the base material. Then brushing follows in a progression from coarse to fine. WHAT:  Skis are waxed, heated and set to bake at a low temperature for an extended time. HOW: Skis are cleaned with Swix Glidewax Cleaner, bases are brushed clean with a soft nylon brush and waxed with a soft wax before being set in a Thermobag. WHY: The prolonged exposure to the heat helps the base material to accept more wax. The resulting process provides an ultra-smooth, deep and fast base surface–the ultimate for fast skis! Need help choosing the right prep?